At 2005 was held VIII International conf. of papiroflexia Barcelona-2005. Some origamists from Russia, Moldova and Ukraine was also send they works to this conference. Some of this work was published in conf. Issue. 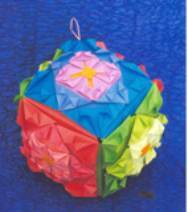 In this page You can see model of “Third-layers kusudama fractal” by Valentina V. Gonchar (Moscow). Origami vase “Swan”. Author is unknown. This model known more than 30 years. Methodic of folding and scheme for this model by V.Gonchar (in Russian) was published in Issue of Siberian conf. 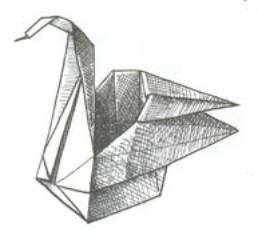 “Origami in educational process”. 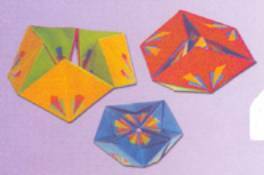 In 1997 Valentina V.Gonchar designed new family of origami modules, named by she Universal origami module. Kinds of this modules folding as the same, but from patterns with different proportions of it’s sides. By using these universal origami modules you can fold all Plato and Archimedes bodies, original toys, dolls and many other figures. Revealed flower (English). Designed in 1997 y. First discussed in II All-Russian Origami conf. “Origami and pedagogic” (S.-Petersburg, 1997). One of participants of this conf., Maarten van Gelder (Netherlands), take author’s permission to use this models in his origami seminars in Europe. First published in 1998 in Russian Origami Journal № 13 (3-1998).